Appointment–Appointment of Lambardar by Collector considering merits of the candidates–High Court set aside the order in writ jurisdiction–Order of High Court not valid. Lambardar is not a Govt. servant. Comments Off on Appointment–Appointment of Lambardar by Collector considering merits of the candidates–High Court set aside the order in writ jurisdiction–Order of High Court not valid. Lambardar is not a Govt. servant. 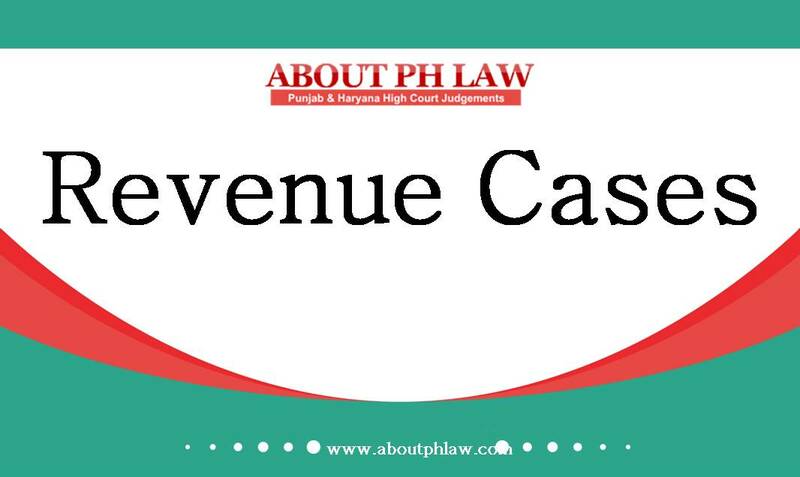 Punjab Land Revenue Rules, 1909, R. 15–Lambardar–Appointment of–Availability of Candidate—As per record petitioner is not permanent resident of the village and residing more often in city—Petitioner held to be rightly not appointed despite having more land than appointed candidate. Comments Off on Punjab Land Revenue Rules, 1909, R. 15–Lambardar–Appointment of–Availability of Candidate—As per record petitioner is not permanent resident of the village and residing more often in city—Petitioner held to be rightly not appointed despite having more land than appointed candidate. 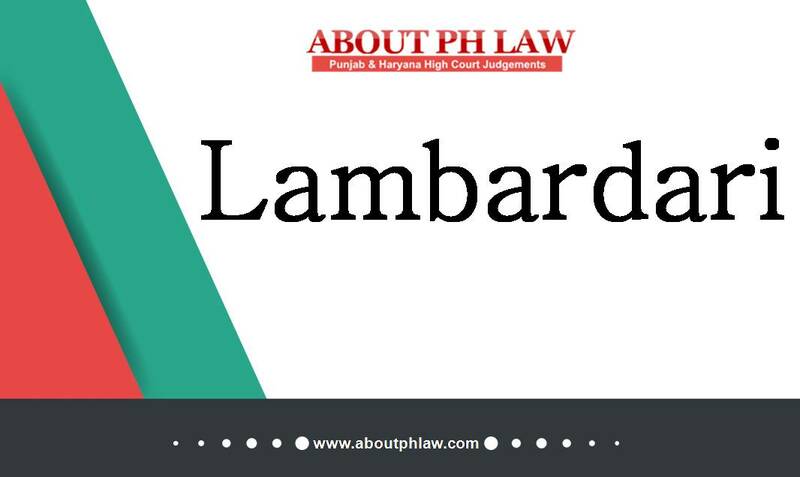 Punjab Land Revenue Rules, 1909, R. 15–Lambardar–Appointment of– Whether the appointed candidate is adopted son of deceased lambardar and whether adoption was legal and valid or not is not the criteria for appointment. Comments Off on Punjab Land Revenue Rules, 1909, R. 15–Lambardar–Appointment of– Whether the appointed candidate is adopted son of deceased lambardar and whether adoption was legal and valid or not is not the criteria for appointment. Punjab Land Revenue Rules, 1909, R.15–Lambardar—Appointment of–Educational Qualification-Beth the candidates are almost equally educated-Choice of collector has to be respected unless there is gross perversity in approach-Appointment upheld. Comments Off on Punjab Land Revenue Rules, 1909, R.15–Lambardar—Appointment of–Educational Qualification-Beth the candidates are almost equally educated-Choice of collector has to be respected unless there is gross perversity in approach-Appointment upheld. Lambardar—Appointment of—Merely because the petitioner has a house in town as well, would itself not make him non-resident of the village. Comments Off on Lambardar—Appointment of—Merely because the petitioner has a house in town as well, would itself not make him non-resident of the village. Lambardar—Appointment of—Genuineness of Educational Certificates—Once the inquiry has been made by SDO, which has not been challenged by any of the candidates on any ground, it deserves to be given due respect and consideration. Comments Off on Lambardar—Appointment of—Genuineness of Educational Certificates—Once the inquiry has been made by SDO, which has not been challenged by any of the candidates on any ground, it deserves to be given due respect and consideration. Lambardai—Appointment of—Subsequent events during pendency of appeal are to be considered by revenue authorities. Comments Off on Lambardai—Appointment of—Subsequent events during pendency of appeal are to be considered by revenue authorities. Punjab Land Revenue (Lambardari) Rules, 1909, R.15–Lambardar–Appointment of—Ownership of land in same revenue estate is not a pre requisite in Haryana. Comments Off on Punjab Land Revenue (Lambardari) Rules, 1909, R.15–Lambardar–Appointment of—Ownership of land in same revenue estate is not a pre requisite in Haryana.